Tom and Judy Smurzynski have been in a very specialized automotive business for over 30 years. This business has set the stage for the creation of Walking Tall. God gives gifts, life experiences, and wisdom to each one of us to use for His glory. They, Tom and Judy, had no idea that God would create a vital and life-giving ministry through their business experience. Several years ago, a tragic incident took place involving a teen girl. She was intentionally stalked and assaulted by three teenage boys at a local community building. A place that should be safe for all. As parents of two daughters, Tom and Judy were deeply affected by the teen violence that took place. They asked themselves, “How or why did this happen?” As evidence became apparent, these young men did not have quality male authority figures in their lives. They saw the enormous void in the lives of these teen boys and felt compelled to do something. Through the ministry of Walking Tall, Tom and Judy have seen young men impacted by caring mentors who show a genuine interest in their lives. As a result of these relationships provided at Walking Tall, the teens are gaining confidence, good character, occupational skills, and a hope found in a God who loves them. Walking Tall also provides an opportunity for the community to make a huge difference in the lives of these young men. We need you to invest in their lives. Our resource needs are project materials, tools, food, and monetary donations. Your donation or monthly pledge, no matter how large or small, will help build a future and a hope for these young men. 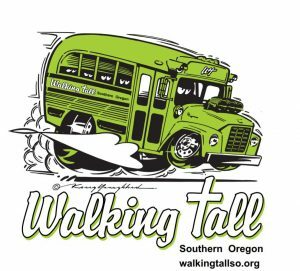 As of February 2018, Walking Tall Southern Oregon is a 501c3 organization.